Do you think the Republicans understand what the internet is? This is an exercise in futility. It's not a model the GOP needs to adopt, because any model will already be outdated by the next campaign. If they really want to remain competitive, they need to look to the Obama campain's ability to read the culture and adapt. Creativity, which is what the Obama campaign truly had, cannot be squeezed out of a model. Just be careful of what you wish for. If more Republicans kept up with the developments in the country around around the world, they may unbecome Republicans. Young conservatives may want to reexamine what conservatism stands for: clinging onto the past. The RNC needs to stop catering to the religious freaks. Think about it. McCain didn't choose Lieberman as his running mate because of Lieberman's pro-choice stance, so he chose Caribou Barbie to appeal to the religious conservatives. The RNC does not need to do that because the Democratic party will always be pro-choice, so the religious freaks will still vote for the RNC, and maybe they'll get more independent voters too. Why couldn't they figure this out before? First the took jazz, then rock and roll, then R & B, then rap, now this too. Wow, always the imitator, never the originator. Anyone freaked out by the definition of 'youth'? Under 29! Dang – just a couple of years ago I would been the 'youth'. OK, maybe 3 years ago. We are just not that important anymore. Sure they were out-managed, out-financed, out-worked and out-thought, and adapting to today's technology and media is essential. But that's not enough. McCain won the nomination because he WASN'T a tool of the far right. But instead of sticking with what got him there, he believed Rush, Hannity and the other blowhards who said he needed to be a "real conservative" to get their crucial support. He gave in to a completely negative campaign that lacked substance and topped it off by neutralizing the best weapon he had – Obama's relative inexperience – by picking a VP candidate that was a joke...all to placate the far right. 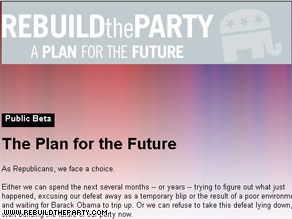 America has moved on...goodbye Rush, goodbye Sean...see you in 2012 if the party doesn't wise up first. More lipstick on a pig. Adopting Barack's on line method is not going to change the fact that the GOP is a hateful, divisive party that hates America. You don't get it – it was more than technology – it was the ground game, the solid team work/leadership, consistent strategy and a message that kept the American people as the priority of the campaign. Neocon copycats. But, hey, whatever floats your ideological boat. Consider that even without highly efficient Web media tactics and even against a fully biased mainstream media, that "old man" McCain came within 5% points or so. I suggest all of you haughty hipsters realize that the things that make this country great are our ideal, which have been around since the Constitution. So maybe you should think twice about being addicted to "change" like some kind of political crack. Our Constituion, based on the "evangelical" notion that we are all equal because we were CREATED equal by a Divine Person, has allowed more change within the USA than any other nation, on every level. So lets not confuse shallow tactics with great statesmanship. How about piping down on the offensive names like Caribou Barbie? The hate from the left is getting out of hand. Tone it down. Your guy is in deep poop and we'll see if his performance equals his promises and whether his statesmanship equals his salesmanship. BS time is over. And all the clever net tricks and media savvy in the world can't cover up whether he can truly lead or not. I hope that he can. For the sake of our country and the world. Lets just stop the bitter crap and get down to business. Time, and past time, for the Republicans to get the message that this election sent: steer away from the fringe politics. The majority of Americans are right around the political center: some a bit left, some a bit right, and all of them are sick to death of the shrillness and anger of the far-right factions that hijacked the Republican Party. The last thing the Republican Party needs is "loyalists" who show up at rallies shouting "Kill him", or candidates who, by their silence, encourage that kind of thinking. Can the gimmicks, forget the clever and easily-regurgitated soundbites and slogans. Show some reason and some recognition that whoever governs this country owes respect to ALL of its citizens – not just some "base". What dyu think 200.000 germans came out to see ? The GOP needs to change it's Grand ol Name to something that is more non-partisan and a party that will work with whatever party in unison to move the "UNITED STATES of AMERICA" forward for all AMERICANS regardless of political stripe. The GOP is experiencing a changing of the guard and what better time to bring it's politics into the present that are according to the constitution "By the People, for the People". Get rid of the policies that have allowed the GOP to lose contact with the American populace. Don't forget 2 heads are better than one.......and technology really helps. They need to come up with a new message. Obama would not have emerged from the Democratic primary if he did not have the right message, no matter how much technological savvy his supporters had. Conservatives do not need a better way of broadcasting the same message. We all know what their message is: government is the problem, cutting taxes is the solution. It has not changed since Reagan. It is just not working anymore. have a canidate that can lift his arms above his head! Creative Staunch Conservative minds is an oxymoron. Creative thinking is the hallmark of us do-gooder liberals, and "Obama's on-line model" is an example of creative thinking and adopting new ideas, something 'Coservatives' hate to do. The more rigidly religious the conservative, the less creative. We'd still think the earth was flat and was at the center of the universe if the right wing Republicans had their way. I'm more concerned with the hate and divisiveness these evil people spread. In your recent question (November 7) about Harry Reid and Nancy Pelosi, I noted that you quoted people from Mississippi, South Carolina and Texas, all red states. Nothing wrong with that, as long as you also get comments from blue states. Afterall, more Americans live in blue states than in red states. What? Recruiting from church isn't good enough anymore? 1. Tell the "base" to go to hell! They need to distance themselves from Rush, Hannity, Savage, Coulter, etc...basically all of the hateful segments of that party. 2. Become more inclusive! The GOP rallies have nothing but old white guys there (no one that looks like me). They need more diversity if they are going to be a serious contender. 3. Find more common issues! We could spend time at each other's throats arguing about petty issues or we could come together to solve problems that could benefit everyone (we might not agree about abortion or anything like that, however neither of us wants our children to go to bad schools). 4. It's not the issues but the tactics! There's nothing wrong with having disagreements about policies (a healthy debate is normal) but when it resorts to name-calling (i.e...godlessness, anti-american), those tactics turn people off. Independent voters like me do not like this stuff at all!!!!!! 5. Put the "good book" down! Now I know this sounds crazy but not everyone lives by the principles of the bible. It's time for this party to stop talking down on those different from a religious point of view. This is outdated and the reason why there is a separation of church and state. This from the group that made fun of community organizing. Who's laughing now folks?